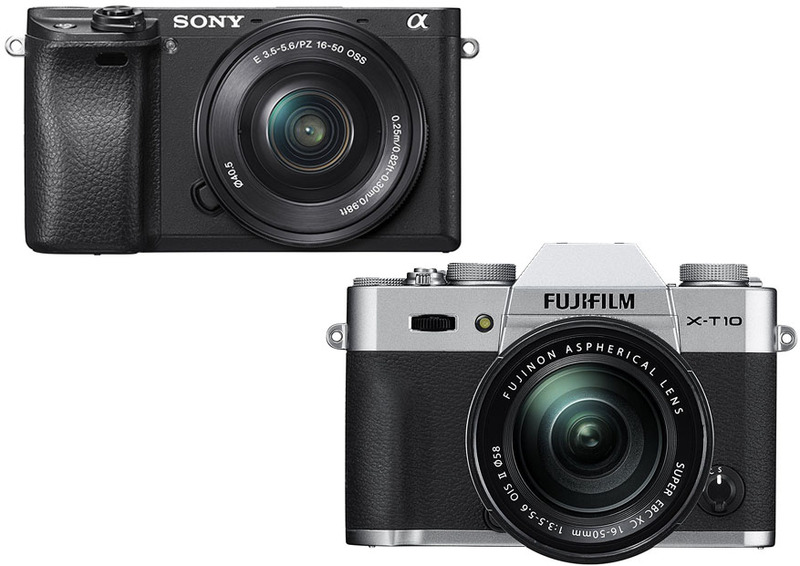 Sony Alpha a6300 and Fujifilm X T10 are two mirrorless cameras with APS-C sensors. However, they come with very different designs and features. Sony Alpha a6300 comes with more features, but it is also more expensive. On the other hand, Fujifilm X T10 is more accessible to the entry-level users. Which one is the better choice for the money? Let’s see the comparisons between Sony Alpha a6300 vs Fujifilm X T10 below! Sony Alpha a6300 still maintains a rectangular shape, but it is larger and heavier, as it measures 120 mm x 67 mm x 49 mm with a weight of 404 grams. On the good side, the housing does feel rugged and is weather-sealed to allow proper outdoor usage. See our previous post about Sony Alpha A6300 vs A7II here! On the other hand, Fujifilm X T10 is indeed taller, as the shape is more similar to that of a DSLR than a compact digital camera, but it is slimmer and lighter. It measures 118 mm x 83 mm x 41 mm, and the weight is about 381 grams. Unfortunately, this model is not weather-sealed, so you will need to be more careful not to expose the camera to rain, water splashes, and dusty winds. Sony Alpha a6300 has the Sony E (NEX) lens mount, whereas Fujifilm X T10 has the Fujifilm X lens mount. Both models have several lens selections. Sony Alpha a6300 works very well with some lenses, especially the pancake 20mm lens. However, it does not have a real killer zoom lens. On the other hand, Fujifilm X T10 works impressively with both the 18-55mm lens and the 50-230mm lens. In the end, Fujifilm X T10 wins this section because the 18-55mm lens is both better and more affordable than Sony’s E-mount lenses. The next difference between Sony Alpha a6300 vs Fujifilm X T10 is the AF system. This difference may matter a lot if you often need to shoot a fast-moving object. Sony Alpha a6300 does come with a more powerful AF system, which boasts 425 focus points. When tracking a fast-moving object, this camera is able to maintain a sharper frame. The focus speed is also faster. On the other hand, Fujifilm X T10 comes with 77 focus points; the performance is more than adequate when in good light, but it is not as powerful as the Sony camera when facing a fast object. Sony Alpha a6300 has very good ISO performance. The ISO range goes from 100 – 25,600 and is expandable to 51,200. The higher ISO levels are quite usable. It has a pleasant grain at ISO 6,400. The maximum shutter speed is 1/4,000s. Sony Alpha a6300 is pretty great for sports and wildlife photography, thanks to the high continuous shooting speed of 11.0 fps. The 24 MP resolution will make it easier to produce large-sized images. On the other hand, Fujifilm X T10 comes with an ISO range of 100 – 51,000 and a maximum shutter speed of 1/32,000s. These features are quite impressive. However, noise may start to create a grain effect from ISO 3,200. This model comes with timelapse recording and the support for UHS memory cards. The continuous shooting speed is 8.0 fps, which isn’t bad. The 16 MP resolution is also capable of delivering sharp, detailed images. If you need the powerful AF for tracking fast-moving objects, high continuous shooting speed, or high resolution, you can choose Sony Alpha a6300. The weather-sealed body is a nice plus. Otherwise, if you don’t have a special need to track fast-moving objects, Fujifilm X T10 can give you a better value for the money. It is more affordable, and the lenses are also better. The ISO range and shutter speeds are great.